Since mankind discovered that the starts are actually suns not much unlike our own, we have wondered what mysterious worlds might orbit these distant balls of light. 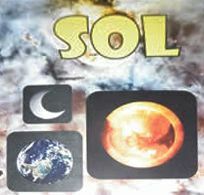 In Sol, two players compete to control these distant suns by claiming the planets around them. Control of the planets is achieved by skillful placement of moons. The player who controls the most suns at the end of the game is the winner! A modular set of 16 board pieces ensures that each game start position is slightly differet. Each game piece is high quality birch wood, laser cut and "direct color printed" for a strategy game like no other.